Reyhanli (Turkey) (AFP) – The Turkish army on Saturday launched new strikes against Kurdish militia in northern Syria as preparations intensified for a cross-border ground operation that has alarmed the United States. Turkey has in recent days sent dozens of military vehicles and hundreds of troops to the border area amid repeated threats from top officials that an operation could be launched at any moment. The army said it hit in “legitimate self defence” camps and refuges used by the People’s Protection Units (YPG) militia in response to fire coming from the Afrin region controlled by the militia group, which Turkey deems to be a terror organisation. AFP correspondents in the area around the Turkish border town of Reyhanli in Hatay province saw several more Turkish military vehicles heading south to the border. Syria’s Deputy Foreign Minister Faisal Mekdad warned on Thursday that the Syrian air force could destroy any Turkish warplanes used in a threatened assault on the war-torn country. 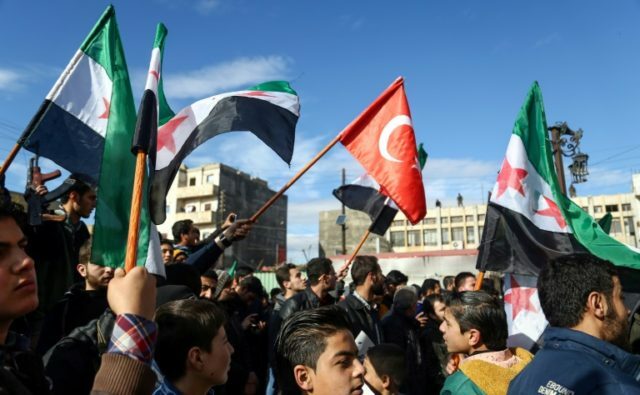 “A full Turkish air and ground offensive will not take place without Moscow’s blessing,” said Anthony Skinner, Director MENA at global risk consultancy Verisk Maplecroft. He added a full Turkish campaign is “not inevitable”, despite the Turkish shelling and deployments to the border area. Turkey’s state-run Anadolu news agency reported Friday afternoon that Russian military personnel in the Afrin area were withdrawing from their positions but Russian Foreign Minister Sergei Lavrov later issued a strong denial. Meanwhile the Turkish threats of an intervention have also raised eyebrows in Washington, which has backed the YPG as it dislodged IS and gained control of the swathe of northern Syria up to the Iraqi border. Skinner said a Turkish operation would be a “serious blow” for the US-led coalition in Syria which still depended heavily on the YPG to stabilise the area after the ousting of IS from major towns. Erdogan had reacted furiously this week to an announcement of plans to create a US-backed 30,000-strong border security force in northern Syria composed partly of YPG fighters, describing it as an “army of terror”. US Secretary of State Rex Tillerson later said the “entire situation has been mis-portrayed, mis-described”, admitting “we owe them (Turkey) an explanation.